What began as a request for a quote for a 30″ x 20″ tap on a 20″ force main and a 20″ bullet head linestop on a force main in April of 2011, finally came to fruition in February/March 2012 in the form of a 20″ pivotal head linestop with a 20″ bypass in the fitting for a permanent bypass around the pumping station. 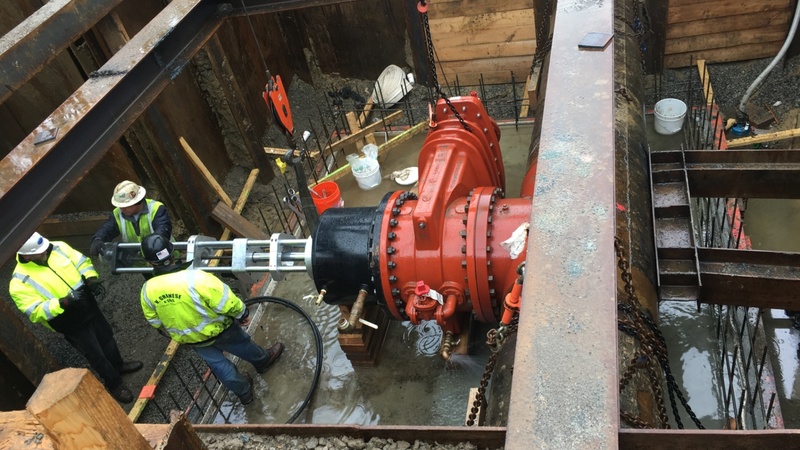 During the 10 months that it took to obtain Owner and Engineer approvals for this work, we probably went through at least three scenarios of how to accomplish stopping the pump station discharge while bypassing the station so that the mechanical piping and pumps in the station could be replaced. Utilizing design plans, it was determined that we could tap the existing 30″ cast iron main with a 20″ and the station could be bypassed into the 30″ and we would install a 20″ bullet head linestop into the discharge line so to keep the line from coming back into the station so it could be rehabbed. Then we said, “Lets do a test pit”. From the test pit, the Engineers decided that the 30″ was too fragile, so all of the work had to be done on the 20″ line. But there was less than 108″ of total pipe length. Too short to accommodate a linestop fitting and a tapping fitting. In addition, ultrasonic testing revealed that the 20″ pipe was only 0.17″ thick. So, SSPLS engineered a plan to have a fitting manufactured that would result in a permanent bypass and we would stop through it using a pivotal head. Hydra-Stop manufactured the fitting for us. We developed a protocol for installing and testing the fitting/tapping valve installation in stages with concrete pours to ensure that the pipe not be compromised. Once the fitting was secured, and all of the valves in place, we tapped it and the bypass was run for a 24 hour period. Then, we installed the pivotal head linstop and the Contractor tore out the pump station. We were back in two days to retract the linestop and install the completion plug.